The MC625R is how K&L Supply defines Air Superiority. This lift combines the best features of our MC650R hydraulic lift with the convenience of air. The new Ram Squared twin cylinder system gives the MC625R a rated working capacity of 1750 lbs. 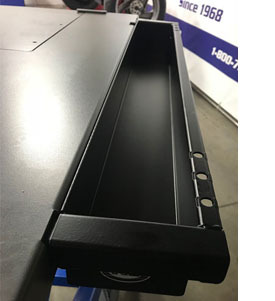 Optional side panels, now with our redesigned fastmount system, increase the working width of the MC625R to 59", allowing the widest utility vehicles and golf carts to be serviced. An easy to install extension is also available, adding two feet front or rear to the overall length for custom bikes. Combine those features, plus the value you expect from K&L, and you have a lift that will be right for all of your needs.